The quality of a silica gel is extremely important when you are using it for chromatography purposes, particularly when dealing with difficult separations of valuable compounds. You need to be extremely confident about your recoveries. SiliCycle is recognized worldwide as a leader in chromatography and purification with our outstanding quality products. SiliCycle's expertise and strong knowledge has been acquired over the years and this distinguishes us from the competition. Note: characteristics listed below can also be applied to IMPAQ & SiliaSphere brands. You can be sure of the outstanding quality of SiliCycle's silica gels because of the closely controlled manufacturing conditions at our ISO 9001:2008 certified state-of-the-art facilities. Our tight control of every manufacturing process step, affords identical and reproducible properties (chemical, physical and structural) as well as ensuring the same chromatographic selectivities. Hence, SiliaFlash is suitable for validated chromatographic processes. Furthermore, our stringent Quality Control and Quality Assurance ensures high performance with no scale-up limitations. Every product meets our quality specifications and is shipped with a Certificate of Analysis (CofA). Individual data sheets are also available directly from our website. Every day, SiliCycle's SiliaFlash products are being used by thousands of satisfied scientists for their purifications. They know that SiliaFlash is synonymous of quality an that they know they will have reproductible results every time. * Other SiliaFlash products have the lowest level of fines on the market. Over the years, in our quest to improve and provide the best quality products, SiliCycle has continuously reviewed how it can make a difference for you. At SiliCycle, a major improvement on our most popular silical gel (SiliaFlash 40-63 microns, 60 Å) has been the absence of fines (small particles under 10 microns). 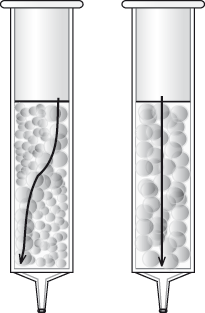 In chromatography, fine particles increase backpressure and can result in clogging which is particularly dangerous when using glass columns. Fines can also pass through filters and contaminate final products. The lack of fines gives a more regular, stable, and reproducible chromatography bed and a faster and more even flow rate for better separation. This improvement comes with NO EXTRA COST to you. The importance of the particle and pore size distribution varies depending on the type of chromatography being done. For instance, it is very important when using HPLC that the particle size distribution of the spherical particles being used be very narrow. Usually used for particle sizes below 40 microns. Particle size distributions are reported in term of D10, D50 (average, mean) and D90. Some manufacturers also mention the ratio of D90/D10. Usually for particle sizes over 40 microns. Particle size distribution is reported in percentage of undersized and oversized. The importance of the particle size distribution varies depending on the type of chromatography being done. For instance, it is very important for HPLC that the particle size distribution of the spherical particles being used be very narrow. When selecting a silica gel, chemists need to take into account that not all 40-63 µm gels are the same. 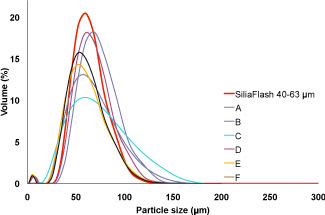 The figure on the right shows the distribution curves of SiliCycle's SiliaFlash gel compared to other manufacturers of flash silica gels. All products were sold as 40-63 µm gels. The two key points of the graph are the height of the volume differential (diff) and percentage of the particles below 40 µm. The SiliCycle curve has a much higher percentage of the particles between 40-63 microns and a very low level of particles below 40 microns (or "fines"). Fines can cause several problems such as higher backpressure, clogging, contamination (see previous section for more details). SiliCycle has the lowest level of fines on the market. The absence of fines gives a more regular, stable, and reproducible chromatography bed, which results in a faster and more even flow rate for better separation. Almost all silica gel manufacturers sell a form of 40-63 µm gel, but not all gels are equal. SiliCycle's SiliaFlash gels have a mean of 90% of the particles in the nominal range compared with 80% for most of the competitors. The connection between particle size distribution and column performance is very simple. When the distribution is broad, the packing is uneven. Some parts are composed of only large particles where the solvent will flow fast and meet little resistance, and there are sections composed of small particles where the solvent flows slowly and meets great resistance. As a result, the solvent, the solvent will take the path of least resistance through the column and flow around the pockets of small particles instead of straight through the column. This uneven flow greatly affects the separation because the compounds will have different retention times depending on their flow path. As they exit the column, the compounds will give broad and poorly separated peaks. 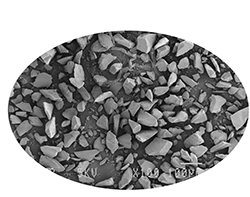 The figure to the right illustrates the effect of a wide particle size distribution versus a narrow one. Narrower particle size distribution gives a more homogenous packing and thus more concentrated fractions. And, by reducing solvent consumption, the process will be more cost-efficient. 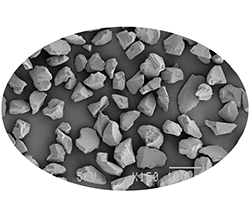 Irregular silicam depending on its method of manufacturing, normally contains trace quantities of a variety of metals. This can, in turn, affect the quality of the separation. Aluminium, iron and lead are particularly problematic because they cause peak tailing. SiliCycle's proprietary technology generates a silica gel with the lowest trace metal content on the market today. As shown in the table below, trace metal concentration in SiliCycle's silica gel is significantly lower than flash silica gels from other manufacturers. Our low trace metal content ensures you will get optimal performance from your chromatography. Tight control of trace metals in every batch also improves your reproducibility and reduces risks of interaction between metals and desired compounds. Water level of silica gel affects the selectivity of the silica. SiliaFlash has a water content between 4 to 6%. This is advantageous for you since the other products have a water variation from 2 to 9% depending on the manufacturer. SiliCycle can also adjust the water level upon request. Our SiliaFlash are pH-adjusted between 6.5 and 7.5 to be safely used in the separation of a wide range of products (a neutral pH id needed to separate pH-sensitive compounds). Once again, this is advantageous when compared to the pH range of 6 to 7 often seen in the market. Higher surface area provides greater separation power.